Here at American Flooring Removal, we hate the mess and dust kicked up by the flooring removal process. If you’re anything like us, then you feel the renovation process is far too messy for its own good. We have an answer to that problem. 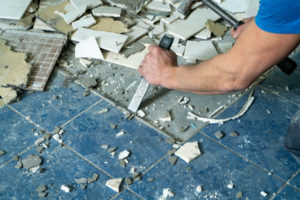 Our dust-free tile removal service in Ponder, TX, is guaranteed to transform your floor without any of the mess involved. When removing old tile, breaking up the material typically kicks up a lot of dust into the air. For those keeping a clean home or with respiratory trouble, dust can be problematic. Our tile removal process literally suctions all dust as it arises. As we break up the tile, we remove the dust from the material and dispose of the tile appropriately. It is a more efficient approach. Anyone who has endured the flooring removal process in the past knows how difficult it can be. That’s why American Flooring Removal went ahead and improved each step. We eliminated the mess associated with flooring removal, all while keeping prices affordable. You’re in good hands! The small town of Ponder has managed to keep its old-school charm while introducing modern amenities. Drive down the street and you’ll spot old-timey construction paired with fantastic eateries and suburban homes. Eliminate dust from the equation with American Flooring Removal. We provide dust-free tile removal in Ponder, TX, and a number of other flooring removal services, too. Call us at 469-556-3936! We serve entire Ponder, TX 76259.